Combine the flour, yeast and salt in a large bowl. Add the honey, egg, water and butter and start mixing with a spoon (you can use a mixer, but I like to do it by hand) until the dough forms. Knead it for several minutes. Add more flour if needed. You should get nice smooth and not sticky dough. Shape it into a ball and grease it with some oil. Put it in a bowl, cover with plastic wrap and then a towel and let it rest (preferably somewhere warm) for about hour and a half. It should double in size. Take the dough out of the bowl and on a lightly floured surface. Cut it into four equal parts. Roll each one into a long rope. Arrange the ropes so they will crisscross and braid them (I used the video at Kosher on a Budget as a guide). Once you shape the bread transfer it to a baking pan/sheet covered with parchment paper and let it rest for another 20-30 minutes. Brush the top of the bread with a lightly beaten egg and sprinkle some sesame seeds if you want to. 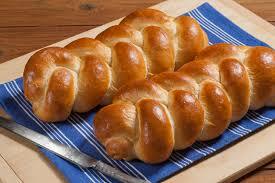 Bake the challah for about 20-25 minutes or until nicely browned on top. I’m looking forward to making this! Thanks for the recipe.